What is the singer neurosis? If I truly knew the answer to that, I would be living in a villa in the south of France! I am not a medical doctor and the truth of neurosis is well above my pay grade, however, as a teacher of voice and a singer, I am very aware of what I shall call "the singer neurosis". 1. a functional disorder in which feelings of anxiety, obsessional thoughts, compulsive acts, and physicalcomplaints without objective evidence of disease, in various degreesand patterns, dominate the personality. 2. a relatively mild personality disorder typified by excessive anxiety orindecision and a degree of social or interpersonal maladjustment. Again, I have no medical degree, but I do deal with the neurosis of the singer daily. For those singers who truly have psychological issues larger than what a voice teacher can handle, this is a disorder that needs medical attention. HOWEVER, a mild case of neurosis as a singer is not uncommon! We hear, or have said at some point in our singer life, a we clutch our throats wrapped in a large scarf, "there is something wrong with my voice!" or "Where has my voice gone?" 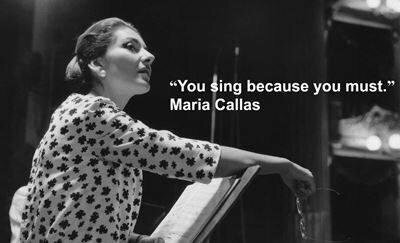 or "I have phlegm, or dryness, or post nasal drop, I cannot possibly sing!" A friend and colleague who has often collaborated with me on the piano and conducted me, told me the story of the singer walking onto stage with her pianist saying "darling, my voice is feeling a little fatigued, can we take the recital down a tone today?" To which the pianist replied, "Of course Diva, your wish is my command." (insert eye roll here) and commenced to play the recital in the keys that were on the page. She didn't know the difference, and of course, sang perfectly well. We have developed an over-ripe stereotype because of it. We need to own it and discover WHY. As singers, we have to discover how we embody INTANGIBLES. This is where the basic neurosis can be linked. Intangibles. We do not have the luxury of looking into the mirror, making an adjustment and continuing to dance. We do not have the luxury of having our instrument on the outside, so when things aren't working we can tighten or loosen a string, use some rosin, change a mouthpiece or reed, or simply stand up and walk away until we are in a better head space! We work in intangibles: breath, and vibration. We work with a physical athleticism that is intrinsically impossible to see while working. We cannot simply stand up and walk away or replace a string, or a reed or add some rosin. We somehow have to take all those intangibles and discover how to make it tangible without getting so emotionally involved that we cannot function. That's what we have to work out. How do we discover this intangible/intangible and intertwine it with craft and mind and thought without it driving us insane? The voice herself/himself (and I speak of the voice in 3rd person to not involve self ego/self sabotage) is FINE. Where she/he chooses to RESIDE (your physicality) is not always optimal. So what is our job? Discover the FUNCTION of the physicality. Allow for the tangibility of that physicality and why it works or what it needs to work optimally so the voice can move in, and feel like it can reside fully. WHY isn't the voice working? That's for YOU to discover and if the focus is physical first - your emotional energy doesn't have to get involved in the production. The body is your instrument. The sound and the resonance and the breath is shaped by how you use your body. The focus then needs to be on discovering how to access that body, intrinsically and extrinsically. I often ask singers, not what they want to change or fix, but rather, what they love about their voice. This is most often met with hesitation, shyness, and sometimes wariness and excuses. Why? Just like body image, we often can great a litany of reasons and a list of things we dislike/want to change/don't understand, but we are not often allowed to speak about what actually gives us joy when it feels good! This does not give you license to be delusional! However, it does give you permission to slow down and discover when things are working, what is actually happening!! So, don't blame your neurosis on "being a singer". I don't buy it. Yes, the discovery of intangibles can be daunting. Yes, it takes more work. Yes, it takes time. Yes, it takes commitment. If you say you are a singer, then I dare you to BE one. Don't fall for the stereotype and let that define you. Let YOU define you. Dare yourself to discover your physical function and let the intangibles have a real place to reside and be discovered consistently. Dare to fight the singer neurosis just by knowing what you are doing, instead of making excuses for what you don't know, while pretending that you are.